Fortunately for restoration druids, our toolkit has not changed too drastically in the Warlords of Draenor pre-patch. Some of our tertiary abilities were removed, but most of our core heals remain. However, it is important to remember that our playsytle will change at level 100. At level 90 our mana pool seems endless, we don’t have access to the game-changing level 100 talents, and damage patterns in raids are not fully converted to the new healing model. At level 100 we will need to watch mana and our raid will rarely be fully topped off. Once Warlords of Draenor releases, we will be releasing another full fledged guide for restoration druids. Tier 15: Displacer Beast is still the go-to talent choice for the mobility tier. Feline Swiftness is a solid passive speed boost, but the utility of a blink ability usually far more valuable. 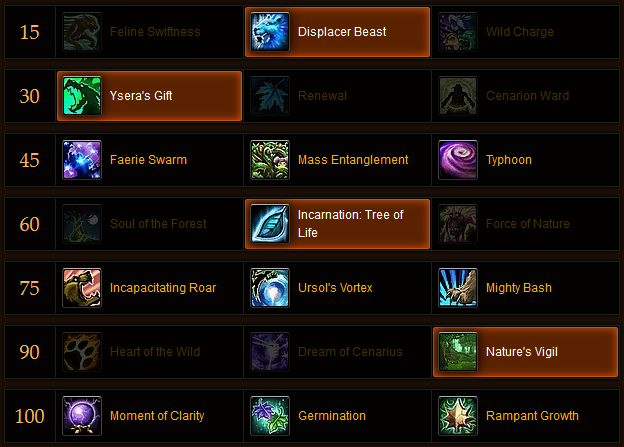 Tier 30: Ysera’s Gift remains the best choice for the survivability tier. Cenarion Ward is “ok” but requires mana and a global cooldowns while still only doing comparable healing to Ysera’s Gift, which is completely passive and requires zero mana or management. Renewal is the weakest of the three choices. Tier 45: As always, all are useful in different situations. Adjust what you take here based on the encounter. However, Typhoon’s range was nerfed in 6.0.2. Tier 60: This tier saw the largest redesign of our talent tree. I have been a long-time supporter of Soul of the Forest for its sustained throughput. Most guides on restoration druid have always recommended Incarnation as the default choice for this tier. I always disagreed; Soul of the Forest was just too strong. However, Incarnation’s 6.0 changes make it incredibly powerful. Rather than buff lifeblooms, Incarnation now increases the healing of all of you rejuvenations by 50% and reduces their mana cost by 30%. With rejuvenation still being our top heal, this is insanely powerful. Couple this with the heavily nerfed Siege of Orgrimmar (meaning way shorter boss encounters), and Incarnation will provide the highest potential throughput in the tier. Soul of the Forest was reworked but in most cases does essentially the same thing as before. 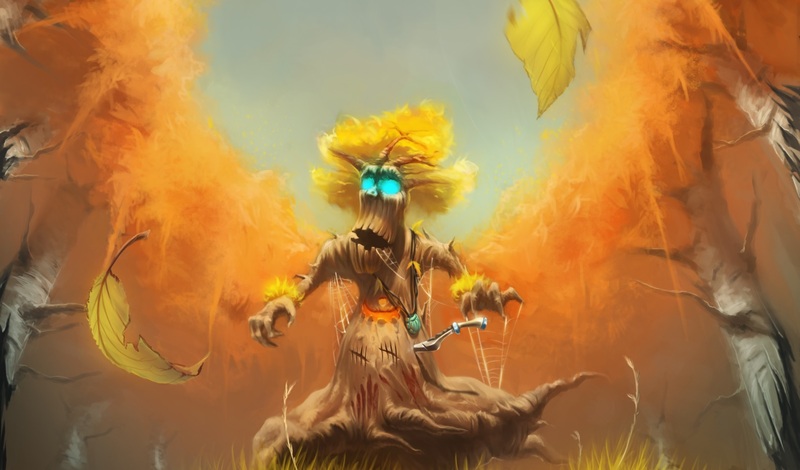 Treant’s spell power coefficients were buffed as well as allowing their heals to benefit from mastery, but they still fall behind the other two choices. Tier 75: As always, all are useful in different situations. Adjust what you take here based on the encounter. Tier 90: With a significant nerf to Heart of the Wild, Nature’s Vigil becomes the clear choice for this talent tier. Heart of the Wild no longer provides a passive buff to your primary stat, but now gives you a six-minute cooldown that increases all your healing by 35% for 45 seconds. This means that Heart of the Wild is only useful for its utility and for extremely short fights where you can have high uptime on the 35% healing buff. For everything else, Nature’s Vigil provides the highest throughput. Tier 100: We will cover this tier after Warlords of Draenor’s release. Glyphs remain largely the same. Glyph of Efflorescence has been removed and made baseline. This frees up a glyph spot for Stampeding Roar or Rebirth. Additionally, Regrowth’s HoT duration has been buffed to 12 seconds (from six seconds), essentially doubling its throughput. This means that on encounters where the Regrowth HoT is not likely to mostly overheal, it is worth dropping the glyph. However, for fights with more targeted damage and less global damage, the glyph is still superior. As always, we want the minor Glyph of Sprouting Mushroom. With the removal of haste breakpoints, haste’s 1:1 value versus mastery has increased. Before the patch, we wanted to reach the 13,163 haste breakpoint then stack as much mastery as possible. Now, mastery and haste are both very good stats to have, with haste being a bit more valuable in most situations. Currently, mastery increases all healing by 1% per 88 rating. Whereas haste increases HoT healing by approximately 1% per 90 rating (assuming the haste raid buff is present). With values this close, the choice comes down to the situation and utility provided by each stat. Mastery will increase the healing of all your healing abilities, whereas Haste only directly increases the healing of your HoT abilities. This is because haste only increases the cast time of casted heals, but does not increase how much they heal (mastery does the opposite). However, when considering the removal of the Swift Rejuvenation passive, Haste’s value compared to mastery increases significantly. With haste lowering the GCD when using rejuvenation (as it had done with all other spells previously), it is extremely valuable. Due to this, and the fact that mana is essentially a non-issue in the pre-patch, I recommend using haste over mastery for itemization, gemming, and reforging. Mastery comes in a close second and is still a very valuable stat. You should aim to have as many pieces of gear with Haste/Mastery as the secondaries as possible. *Use the Quick Sun’s Radiance (+20 haste) gem in blue slots when the socket bonus is not mastery, haste, or intellect. Thanks for checking out our patch survival guide for Restoration Druids! If you have any questions at all please feel free to put a comment below and I will attempt to answer them as soon as possible. As always, if you find anything to be out of date, inaccurate, questionable, etc. please leave a comment or tweet us as soon as possible. Finally, there is only so much you can put into a guide, so please read our other Raiding Guides and Theorycraft Essays regularly, as many of them will be about resto druids. Happy Healing!